Corporate Computer Centers often manufactures computer systems for unusual, ultra mission critical applications. These include military projects, critical public access servers and advanced workstations. We've detailed some of our more interesting projects below. Gamma Metrics Bulk Coal Analyzer: Corporate Computer Centers designs and manufactures custom small form factor ruggedized computers for these massive devices as well as the similar Bulk Cement Analyzer. Each computer is a small cube shaped passive backplane computer which acts and the primary processor and controller for each analyzer. These machine are huge and return real-time data on the composition of the coal or cement which is poured through their sensor path. Using a radiation source and analyzing the neutron backscatter, these NRC regulated machine allow mines and cement manufacturers to fine tune their product or production to meet stringent customer needs. These devices are deployed all over the world. Northrop Grumman Corporation Global Hawk Unmanned Air Vehicle: Corporate Computer Centers has manufactured hundreds of workstations for use in this Air Force project. The Global Hawk Unmanned Air Vehicle (UAV) is being developed for the military to serve as an advanced battlefield reconnaissance platform. 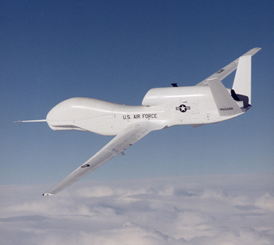 The Global Hawk features advanced sensors and can operate both under ground direction and autonomously for extended periods of time at high altitudes. Corporate Computer Centers' PowerStation computers are being used to develop, deploy and produce the Global Hawk UAV. In addition, several special workstations process, display and store video data from the Global Hawk. Other PowerStation computers are in use for mission critical flight operations at Northrop Grumman's Ryan Aeronautical Center San Diego and Edwards Air Force Base facilities. One of these systems disseminates data directly from the Global Hawk to huge color plasma displays in the Mission Control Center. For more information on the Global Hawk visit Northrop Grumman's Global Hawk Home Page. Northrop Grumman Corporation Fire Scout Unmanned Air Vehicle: Corporate Computer Centers has manufactured hundreds of workstations to support the bid process and development of this Marine Corps project. The Fire Scout VT-UAV (Vertical Takeoff Unmanned Air Vehicle) will provide the Marine's with unmatched reconnaissance capability with virtually unlimited base of operations choices. 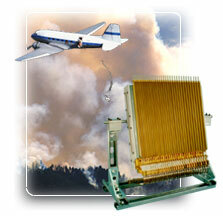 For more information on the Fire Scout visit Northrop Grumman's Fire Scout Home Page. Radyne Comstream Satellite Communications System: Corporate Computer Centers designed and manufactured dozens of 1U and 2U rackmount computers for use as processors in Radyne Comstream's satellite communications systems. These computers are the primary controllers for these advanced transceivers. Sony Online Entertainment's EverQuest Online 3D Role Playing Game: Corporate Computer Centers has manufactured over two hundred advanced PowerServer systems for this exciting project. 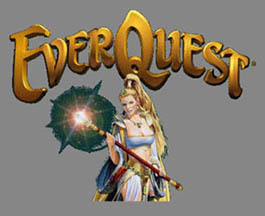 EverQuest is the hottest online game in history and offers ultra realistic three dimensional fantasy worlds that support thousands of simultaneous players. The game's servers (organized in farms) were designed specifically for this project by Corporate Computer Centers and tested for several months while the game was in development. Since the game is so popular, server reliability is a must. Sony Online Entertainment relied on Corporate Computer Centers for ultra reliable servers for this mission critical application. In addition, most of Sony Online Entertainment's and Sony Computer Entertainment America's PC and PlayStation games are developed using Corporate Computer Centers' workstations. For more information visit the EverQuest Home Page. Sony Online Entertainment Web Servers: Corporate Computer Centers has manufactured several dozen PowerServer systems to host Sony Online Entertainment's popular The Station at Sony.com and other related web sites. These special two unit (2U) rackmount servers pack power and reliability in a small form factor. The Station at Sony.com hosts popular online games such as EverQuest, Wheel of Fortune, Jeopardy and Tanarus. Sony Online Entertainment turned to Corporate Computer Centers for this mission critical application because of our excellent products, service and support. For more information visit the Station at Sony.com. USS John C. Stennis: Corporate Computer Centers has manufactured several dozen workstations for use aboard the United States' newest aircraft carrier, the John C. Stennis. These systems are used for non-combat administrative use aboard the ship. The crew of the Stennis was so impressed with their PowerStation IV computers that the Captain and Executive Officer both ordered systems for their own use. For more information visit the USS John C. Stennis Home Page. Trex Enterprises Passive Millimeter-wave Camera: Corporate Computer Centers has manufactured several rack mount passive backplane computers for this advanced Air Force project. The Passive Millimeter-wave Camera (PMC) "sees" through fog, rain (even walls) and total darkness. The system is destined to be used on military and civilian aircraft for zero visibility takeoffs and landings. The camera detects low energy blackbody microwave emissions. The data is processed and combined with infrared and visible light and displayed in real time using a Hot Chip RackStar system. The project is currently entering a flight test phase aboard a Huey UH-1 helicopter. Corporate Computer Centers' RackStar systems will be flying and performing all data acquisition and processing throughout this testing phase. In addition, most development for this project is conducted on PowerStation V computers. Trex Enterprises Adaptive Optics System: Corporate Computer Centers has designed and built a RackStar rugged workstation for use in this Navy project. Trex Enterprises has developed an advanced adaptive optics system for use in developing and testing a Navy anti-missile system. The computer system is being used for primary data acquisition at the test center in Kauai, Hawaii. Gamma Metrics Coal Cross Belt Analyzer. Copyright © 1994 - 2001. Corporate Computer Centers, Inc.